Barra passenger and car ferry ticket prices, timetables, ticket reservations and information for ferries sailing from Barra to Oban, South Uist, Lochboisdale and Eriskay. Compare all available Barra ferry ticket prices in real time and book the cheapest available Barra car and passenger ferry tickets sailing to and from Barra, Oban, South Uist, Lochboisdale and Eriskay with Caledonian MacBrayne ferries online with instant confirmation. Book Barra Ferry Tickets with Caledonian MacBrayne for ferries sailing from Barra to Oban, South Uist, Lochboisdale and Eriskay online in advance to enjoy the cheapest available ferry ticket price. The price you see is the price you pay. There are no hidden extras or surprises such as added fuel surcharges or booking fees and we do not charge you anything extra for paying with a Visa Electron card. The price we quote you for your selected Barra passenger or car ferry ticket, onboard accommodation and vehicle type is all you will pay, and that's a promise. To obtain a Barra ferry ticket price and book your ferry ticket securely online please use the real time ferry booking form on the left. You are also able to add a hotel at your destination, or anywhere else, to your ferry ticket when completing your ferry ticket reservation. If you really want to get away from it all, visit the tiny island of Barra for its empty golden beaches, sandy grasslands, wild flowers and rugged interior. Nestling near the bottom of the Western Isles chain, it has been quite rightly called "Barradise". Barra is an irregularly-shaped island measuring some eight miles by five: it's tempting to think of it as resembling a giant turtle, swimming north east. The encircling A888 marks the outline of its shell, and there are four flippers projecting beyond it. Those at the front are more delicate, those at the rear are more heavily built, and there's a head sticking out to the north east. In 1937 the American architect Robert MacNeil, who had been recognised as the 45th Clan Chief of the MacNeils, visited Barra soon after the opening of the airport on the island. He purchased most of the Barra estate lost to the family in 1838, including Kisimul Castle. The island's village capital of Castlebay has long been seen as the main gateway to Barra. It is the terminus for the ferry link to Oban and Lochboisdale in South Uist. From 2003, the island opened a new "back door" with the full operation of the Sound of Barra Ferry linking Ardmhor in northern Barra with Eriskay, which in turn is linked by causeway to South Uist. Castlebay is dominated by the attractive Church of Our Lady Star of the Sea, while at the west end of the village is Dualchas (the Barra Heritage Centre). From the west end of Castlebay a side road heads south to the causeway linking Barra with Vatersay. You can think of Barra as a shoreline of rocky bays and stunning beaches surrounding a largely inaccessible and mountainous interior. Apart from Castlebay itself, the only significant settlements are around Northbay in the north east of the island, and Borve in the west. A detour from the main road taking in the northern end of the island is an important part of the Barra experience. Here lies the main fishing harbour of Aird Mhidhinis, industrial but full of character. Here, too, is the terminus for the Sound of Barra Ferry. And close by is Barra's world famous beach airport at Traigh Mhor. North again is Eoligarry with the ruined church and chapels of Cille Bharra and stunning views to Fuday and to Eriskay beyond it. The island is great for cycling, walking, watersports, etc. Barra Power Kiting - contact Nick and Kay - tel: 01871 810950. Barra Snorkel Safari offers a 90-minute session with 2 experienced guides and all equipment provided. Tuition also available. Clearwater Paddling - sea kayaking day trips from Barra. Weekend tours and longer holidays also available. Tel: 01871 810 443. Island Adventures offers 2 hour boat trips from Castlebay towards Mingulay on the Glen Ann Tel: 01871 810 284. (purpose built for sealife observation). Boat trips to Mingulay, Eriskay, Barra Head, etc. can be arranged - try Barra Fishing Charters (tel: 01871 890384). Mingulay (uninhabited) has fantastic bird colonies. Began as a 19th-century fishing port, today it is home to the vehicle ferry (which brings in much of the island's food and supplies) and has a couple of hotels, church, post office (originally opened in 1875), public telephones, school, Royal Bank of Scotland, grocers with petrol station, supermarket, swimming pool, sports hall, tourist information centre with community shop, next door. In the main street, there's a cafe which operates as an Indian restaurant at night. Kisimul Castle (there are several different spellings) sits on a rocky islet in the bay just off Castlebay. Legend has it that this has been the stronghold of the MacNeils since the 11th century. With its square keep and curtain wall, Kisimul has a similar design to Dunstaffnage Castle. To withstand sieges, the castle was equipped with two artesian wells to provide water and a fish trap in a catchment basin. A galley used to be berthed alongside on a sloping beach with the crewhouse nearby. At the first sign of trouble, the crew were expected to launch the ship and defend the castle from attack. A small boat takes tourists across to the castle during the summer (daily from 1 April to 30 September). Admission charge to the castle includes the boat fare. Tel: 01871 810313 or contact Historic Scotland. Hill overlooking Castlebay. The record to run to the top and back in the annual hill race stands at 24 minutes. Halfway up the side is "Our Lady of the Sea", a white marble statue of the Madonna and Child. This island just south of Castlebay was linked to Barra by a causeway in 1990. I believe that there is a bus from Castlebay from Monday to Saturday. Sites on this tiny island include: the remains of a Catalina flying boat which crashed near the road during the Second World War, Vatersay Bay, a sandy beach on the eastern side of the island, the monument to victims of a shipwreck which occurred in 1853 when the Annie Jane left Liverpool bound for Quebec with hundreds of emigrants. The ship was swept onto the rocky Vatersay coast and most of the passengers were drowned. Also known as Castle Sinclair. Located on an islet in Loch Tangusdale is a medieval tower-house which originally had 3 storeys, measuring 2.9 x 2.6 metres inside, with walls 1.4 metres thick. Nearby is the so-called St. Columba's Well. Nine-hole golf course with electrified fencing around the holes to keep the sheep away. Tickets available from hotels or the Tourist Information Centre in Castlebay. Huge tidal beach which serves as the island's airstrip for regular flights from Glasgow and Benbecula. Unique in this country as being the only runway washed by the sea. Refreshments can be bought in the small airport terminal building. Toilets also available. The islanders go out collecting cockles from the wet sand. Mrs. M. S. MacNeil, Ceol Mara, Nask (near Castlebay). Tel: 01871 810294. Modern bungalow overlooking Castlebay. Panoramic views to Minch and islands. Large comfortable lounge. Rooms: 2 twin and 1 double (all ensuite). Mrs. Linda Maclean, Tigh Na Mara, Castlebay. Tel: 01871 810 304. 3 star guest house. 2 minutes walk from ferry. 5 bedrooms (single, double, twin). B&B or room only. Mrs. Anne MacNeil, Grianamul, Castlebay. Tel: 01871 810 416 / Fax: 01871 810319. Overlooking the bay, near ferry terminal. Next to swimming pool and sports hall. Rooms: 1 double and 2 twin (all ensuite). Open April - October. Castlebay Hotel. 3 stars. Tel: 01871 810 223. Craigard Hotel in Castlebay. Tel: 01871 810 200. 3 stars. Rooms: 3 double, 3 twin, 1 family (all ensuite). Open all year. Heathbank Hotel - a 3 star inn with 5 ensuite bedrooms at Northbay. Tel: 01871 890266. Isle of Barra Hotel, Tangasdale Beach. 30 rooms. Large modern building, family run, good food, nice location on the west coast of the island overlooking a beach near the main road. Tel 01871 810383. 11 Ardveenish has 2 bedrooms (1 double, 1 twin) and sleeps up to 4. Situated by the shore at Northbay. Mingulay Cottage at Bruernish in the north-east of Barra sleeps up to 6 people. Best Price Guarantee - We always offer you our lowest available Caledonian MacBrayne passenger and car ferries ticket price to and from Barra. There are no hidden extras or surprises such as added fuel surcharges or booking fees and we also we do not charge you anything extra for paying with a Visa Electron card. The price we quote for your selected Barra ferry ticket, onboard accommodation and vehicle type is all you will pay, and that's a promise! In the unlikely event you find the same all inclusive Barra ferry ticket cheaper in the brochure of any other tour operator we promise that we will do our best to beat that price or offer you the choice of requesting a refund. 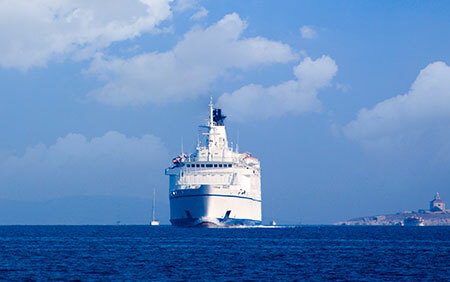 To book Barra car and passenger ferry tickets please click here. At ferryto.co.uk you are able to obtain live Barra ferry ticket prices, check availability and book car and passenger ferry tickets to and from Barra at our lowest available ticket price. Ferryto.co.uk is part of the world's largest online ferry ticket distribution network providing the ability to book over 80 major European ferry operators including to Barra and to over 1,200 other ferry routes throughout the UK, France, Spain, Ireland, Holland, Eastern Europe, the Mediterranean, the Baltic and North Africa.